Amazon is taking the world by storm. Quickly rising to become the second most valuable company in the world, Amazon creates many things that are intended to make our everyday human lives easier. When we think about how secure and private our online lives are, I immediately think about different sites and how things magically appear in ads and music. For example, Spotify makes daily playlists based on the music you have listened to recently. I have a few playlists dedicated to soundtracks, old school Disney music, and especially being depressed. In March 2017, Amazon filed a patent for the Amazon Alexa. This patent is titled, “voice-based determination of physical and emotional characteristics of users.” What a mouthful. Basically, Amazon wants the Alexa to listen to the tone of your voice and determine what mood you are in. This would be used to assess what you need and possibly suggest things for you. The example that is shown in the patent itself shows that Alexa would suggest the person watch a movie when his or her voice seems bored. Another example shows Alexa would suggest recipes for soup or different brands of cough medicine when a user sniffles or coughs when speaking to the device. Would this technology be useful in the future? I actually think it would. Don’t let Deloy know I think technology isn’t evil for once. 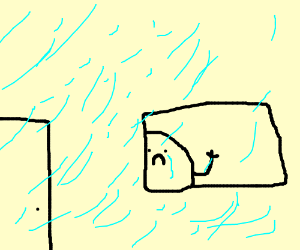 Sad person watching the rain. Aka: me. Source: Noah Raider on Drawception. Hear me out. Most people don’t really want to go out to the world and talk about their mental health. I, personally, would much rather sit in my house with some music and a mug of tea instead of talking about my feelings with another human being. Having this patent technology around for users who can’t just go out and talk about things would be great. The example of someone being sick would also be very useful for people who need someone, or in this case something, watching out for them. People are still scared to death of Alexa and Echo and all of the other personal assistant devices listening in on our conversations, however. One article from theatlantic.com talked about how we are becoming different kinds of marketable categories. When profiling us to sell products, we would not just be different genders or ages, but also different levels of emotional and mental stability. This could also affect more in the future if the companies decided to sell or give our information to other companies and places. Someone could find that a man is anxious and depressed and not allow him to live in a certain area or have a high-stress job. But this is a huge stretch for the future and this level of technology. I don’t think we have a problem with this for a very, very long time. 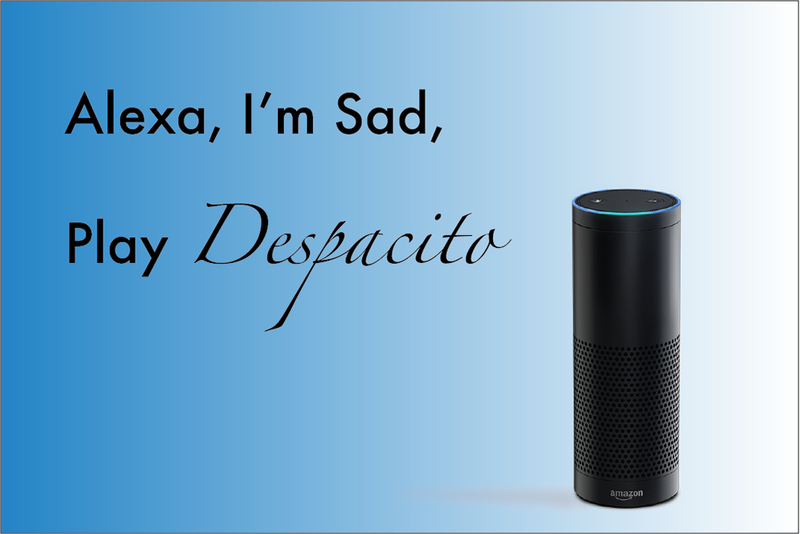 The patent for Alexa’s emotional reading AI would also take into account the emotional characteristics of your voice. depending on if you seem happy, sad, excited, bored, stressed, scared, or any other emotion. Alexa would tag each characteristic and place it with a certain emotion. That way when Alexa hears them again, it will know exactly what you are feeling. The patent also states that Alexa will look into your browsing history and past purchases in order to determine what is relevant to present to you. I would personally love it if I had something that could tell what I am feeling and be able to give me what I might need in any certain mood. If I am feeling sad or anxious, a movie suggestion would make my day a little brighter. If I was angry or upset, Alexa could suggest something to ease my mind and clear my head. If I were sick, I’m calling my mom first, and then I would see what Alexa could get me as well. This technology could help many people if it were to be brought forward to the public. When it comes to our privacy, however, it seems like another piece of tech taking information from us to use at any given moment. This does not seem like bad information to have though. I do not think robots are going to come and take over and find the weakest links of society based on how sad people were compared to others. I think this tech can be used for good and still give us some privacy at home and peace of mind. Now, I’m feeling a little down myself right now. Alexa, play Despacito, please.